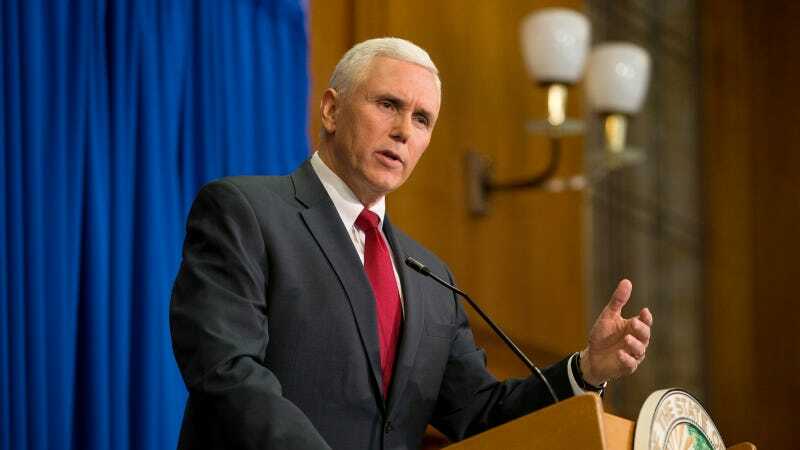 Republican vice presidential nominee Mike Pence said on Tuesday that he believes there is "no question" that human activity has "some impact on the environment and on the climate." He'd better not tell his running mate, Donald Trump, who believes that anthropogenic climate change is one big ol' Chinese hoax. Pence spent some time in the 1990s writing a series of anti-science op-eds proclaiming that global warming is a "myth" (and also, for good measure, that "smoking doesn't kill"). By 2009, Pence claimed that the science on climate change was "very mixed" and that there was "growing skepticism" about whether or not humans contribute to it. But now, in 2016, as the GOP nominee for the vice presidency, Pence thinks there is "no question" that human activity contributes to climate change. "Well, look," he said on CNN, "there's no question that the activities that take place in this country and in countries around the world have some impact on the environment and some impact on climate." Of course, Pence still has a long way to go to catch up to the scientific consensus on climate change. There are already people being displaced because of environmental changes and it feels like every day planet earth crosses some new, frightening irreversible threshold; what's needed is action, not merely a belated acknowledgement of the problem. That's probably why another area of scientific consensus is that politicians need to spend more time addressing these issues. Trump, however, has even farther to go than Pence. Even as Pence took his new position on CNN, Trump's campaign manager Kellyanne Conway told the news channel that Donald Trump still "believes that global warming is naturally occurring." For his part, Trump has said he's “not a big believer in manmade climate change"—and his campaign draws heavily on the help of political apparatchiks who have spent years denying climate change and denigrating those who believe in it. At least the Trump campaign has backed away from the former reality TV star's assertion that climate change is a Chinese hoax perpetrated on Americans to slow our economy, as Trump had tweeted in 2012. After Trump denied in Monday night's debate that he ever said such a thing, Pence told CNN that the Trump tweet was just the GOP candidate being "humorous."